The other day I was at work listening to an audiobook that I checked out from the library (Thank God for local libraries!). Quick side note: I love my job, and I will be writing a future blog entry about it…innyhoo back to the audiobook. So I’m at my desk listening to the audiobook and all the excitement kept building up until I could not take it anymore. So I leaned my head on my desk and screamed “Yes Yes Yes Lord” while simultaneously screaming “NO No NO, No more good news!” Yes believe it or don’t, I was screaming these things…in my mind of course, I mean I would not want to scare off my colleagues in the cubicles beside me…but yeah I highly recommend this book. 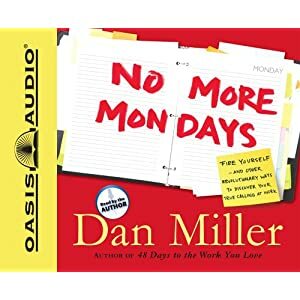 The title of the book is “No More Mondays” written by Dan Miller (also the author of “48 days to the work you love”). He talks about why is it that no one says thank God it’s monday? Because most people hate their jobs! Hating your job is an unfortunate waste of time because you have this great and unique talent that God has given to you to make a difference here on earth, and no matter what you do you cannot squeeze your “difference making” to just weekends. Remember that as a man thinks in his heart, so is he…so if you think you deserve to be unhappy at your job, then you do. Or if you think you will never make money doing what you enjoy doing, then you won’t. But if you think you will be successful in whatever you decide to do, then you will.